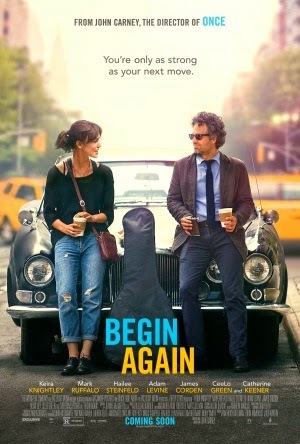 From writer/director John Carney who wowed audiences in 2007 with his musical hit Once, Begin Again stars Kiera Knightley and Mark Ruffalo as aspiring musician Greta and disgraced ex-record labeller Dan, respectively. When Dan stumbles across Greta performing in a small New York nightclub, he is engrossed in her musical talent and the two form a collaboration to produce an album that will help their careers flourish. Begin Again is one of those extremely low budget indie films that deeply appreciative film fans will crave; a superb cast and a heartfelt story work beautifully alongside the films quirky sense of humour. It's a musical at its heart but one thats still grounded in reality; characters don't burst out into song and dance along the streets, but instead the music comes from the narratives' core of producing an album outside of the studio system, with Ruffalo trying to bring out the raw talent he sees in Knightley from the very start. Ruffalo easily steals the show with his deep and equally funny performance, and the chemistry he shares with Knightley is absolutely flawess; she too moulds her role into a memorable and complex one with a great sense of humour. The supporting cast is just as charming; James Corden proves every now and again he can be a lot more than a poor mans Nick Frost, and co-stars Hailee Steinfeld, CeeLo Green and Adam Levine also bring their quirky charms into the narrative. It's definitely a feel good movie at its core, with complex themes and adult jokes, but an elated vibe is always present throughout. Comedic timing in the script is absolutely superb and thanks to Carney's direction and the performances themselves, moments that erupt the audience into hysterics are delightfully common. Begin Again runs for 104 minutes. I don't know whether it was due to a late night showing or whatever, but to me the movie felt like it was over 150. Sluggish pacing is sometimes a concern, and this could've been tweaked in the cutting room for sure - there are a few pointless scenes where the story comes to a halt just to add in some more jokes. The jokes work as I've said, but not when they feel inherently unnecessary. But with negativity aside, Begin Again is a charming indie flick with a warm heart and vibrant tone. While it may not be as easy to find as Michael Bay's newest $200 million turd, it's definitely worth the effort if you respect your taste in movies.